I recently received a couple of neat items from Bev & Trev at Zoom Resources to test and review. The first item I reviewed was the Advanced Avionics Apex V12 Switching Power Supply: an AC adaptor specifically designed for powering battery chargers from a wall socket. 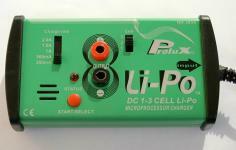 In this review, let's take a look at the Prolux 3834 1-3 Cell Lipo Charger. As you are probably aware, there are primarily two charging choices for LiPo cells at the moment. At the sub $50 US end of the scale there are the cheaper chargers, which while very capable, usually require a power supply of over 12V to charge 3-cell and up packs. In the middle/high range there are some very capable chargers with built-in inverters, which will charge 3-cell packs from a 12V supply, but they generally start at around the $100 US mark. The Prolux 3834 Charger attempts to bridge that gap. Here is a charger that claims to charge from 1- to 3-cell LiPo packs from a 12V supply (i.e. it has a built-in inverter), but costs only $45 NZ (~$30 US)!!! an LED and buzzer to signal the various charging conditions. The input leads enter from one side of the device and are terminated with standard banana plugs. The charger also comes with a pair of crocodile clip style terminators to convert the banana plugs into crocodile clips if you so desire. The charging leads plug into the top of the unit and are fitted with a standard JST style connector. Obviously you can cut this off and replace it with your preferred style of connector, or, as I did, simply make an adaptor to change the JST to 2-pin Micro Deanes for some of packs. The single A4 instruction sheet was a good effort, but lost a lot in the translation, to the point where in some places it was downright wrong! A lot of the information was correct, once you figured out exactly what it was they were trying to get across, but some of it was so far off the mark it wasn't funny. Fortunately, most of the errors will not hurt anything, you just don't get the beeps that you are led to expect. I spoke to Trev from Zoom about this, and he has indicated that Prolux would be more than happy to update the instruction sheet, if I could supply them with a better translation. For those of you who might purchase one of these devices, I have put a quick and dirty guide of what to expect when operating the charger at the bottom of this review. Output Voltage: 3 Position Selectable - 1, 2, or 3 Cell LiPo Pack. In-built invertor allows you to charge 3-cell packs with a 12V source! For a low-cost charger the Prolux 3834 certainly packs in the features! Aside from being able to charge 1-3 cell packs from a 12V source, and charge at five different charging rates, it also has both under-cell, and over-cell charging protection so that you don't charge your two-cell pack at three-cell rates or vice versa. One unique feature of this charger is a 'forced charge' mode for when your pack voltage has fallen below the detection voltage for that cell count. In this situation, you press and hold the start button for three seconds. The charger will respond with two beeps and will then charge the battery for two minutes only in an attempt to bring the pack voltage up to detection level. The Prolux 3834 also features short-circuit and overload protection on the output via a self-resetting PTC device. Not a bad line up for a 'cheap' charger! As I really wanted to confirm that the inverter worked, I initially used an old PC power supply as a DC source for the Prolux. The one I chose put out a steady 12V, and is rated at 12A on the 12V line, more than adequate for testing. Initially, I set the charger up with a pair of meters attached so that I could measure the voltage and current as it was charging. I'm pleased to report that it worked correctly for all three cell counts, all five charge rates, and the inverter worked fine on the 3-cell packs! Later, I also used the new Advanced Avionics Apex V12 Switching Power Supply, with great results! Having established that it wasn't going to fry my cells, I tested the auto-cell count detection which also worked flawlessly, giving different 'beep' signals to indicate too few (or too many) cells, and inhibiting the charge until the cell count switch was correctly set. I also briefly tested the short-circuit protection, and found that that worked fine too, cutting off the power at the first sign of a short. Being a PTC device, it does take a few minutes to re-set after a short, so don't panic if the charger doesn't immediately burst into life once you clear a short. An unfair comparison test gives surprising results! While I was doing my meter tests, I'd noticed that the Prolux has a low current cut-off of 250mAH (i.e. the charger cuts off once the charging current drops below the 250mA mark). This is not necessarily a bad thing, as it helps to avoid overcharging, at a slight cost in total battery capacity. I was a little curious to find out exactly how much capacity this feature was costing, so I set up a test against my rather expensive (TEN TIMES the cost of the Prolux) European built charger. This charger charges right down to 30mA before cut-off, so it would give me a good indication of how much capacity was lost through the 250mA cut-off. I fully charged a 2000mAH LiPo on the Prolux, and then put the charged battery onto my other charger at a 250mA charge rate. On my expensive charger I only managed to squeeze another 100mAH into the battery, and it took nearly ninety minutes to achieve that! This tends to indicate that the Prolux is charging the cells to around 95% capacity, even with a fairly conservative 250mA cut-off. Impressive! Over the following two weeks I repeatedly tested the Prolux in 'real world' conditions. I charged a wide variety of packs of different capacities and cell counts. The unit performed perfectly throughout this extended test period, and no issues were forthcoming. In its price range, the Prolux 3834 is by far the best dedicated lipo charger I have seen to date. It has many features that are normally only found on much more expensive models, and it performs exactly as advertised. The cell-count auto detect feature should save much heartache for those that use more than a one pack format, and the built-in inverter is a real boon for charging 3-cell packs from a 12V source. The ability to charge 1-3 cell packs, and the 2A maximum charge rate should satisfy the needs of the majority of indoor and park flier pilots. With a price of under $50 NZ ($30 US), this charger represents excellent value for money, and I recommend it to anyone looking for a LiPo charger in this price bracket. This charger has excellent 'bangs per buck' value! N.B. Check your polarity whenever connecting batteries or chargers! Plug the output leads into the charger and connect the input leads to a 12V DC power source. The charger will beep once and the LED will flash once to confirm correct connection. Select the desired charge rate using the 5-position charge rate switch (250mA, 500mA, 1A 1.5A, 2A). Select the desired cell count using the 3-position cell count switch (1, 2, or 3 Cell pack). Connect the battery to the charger. The charger will beep once, and the LED will start to flash slowly to indicate correct battery connection. Press the Start button. If the switch settings are correct the charger will beep once and the LED will turn on solid to indicate charge in progress. If the cell count switch is set higher than the actual cell count, the charger will beep rapidly and the LED will flash rapidly until you change the cell count switch to the correct setting. If the cell count switch is set lower than the actual cell count, the charger will bleep once, and then go back into standby mode with the LED flashing continuously. Once the charge is completed the charger will give one long beep and then a continuous three-beep cycle with the LED flashing, indicating that the charge is finished. The start/select button also acts as a stop button. If you wish to terminate a charge prematurely, simply press the start button while charging. The charge will cease and the charger will go back into standby mode. I am currently using this charger. Everything about it is all good. Except one thing, it doesn't come with a balance charging option. Do I need to get one of those external balances? Is balance charging all that important?